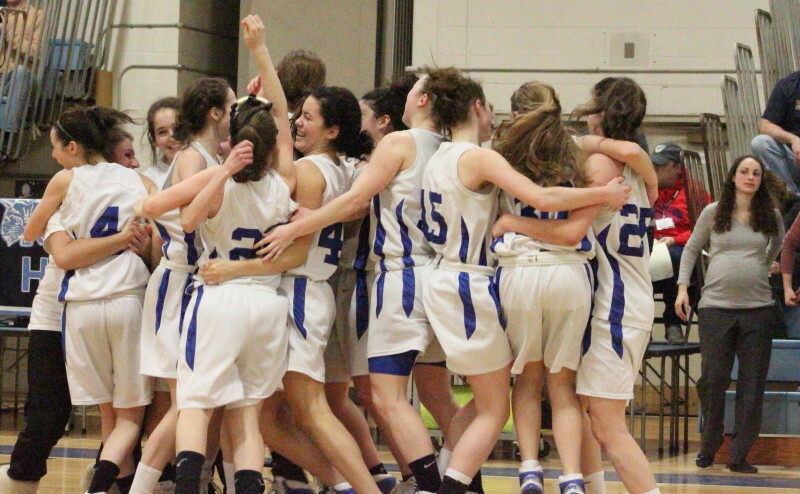 (Wilmington) #1 seed Stoneham played exactly that way and eliminated #4 seed Ipswich, 51-31, before a colorful crowd at Wilmington High School to reach the Division 3 North finals. 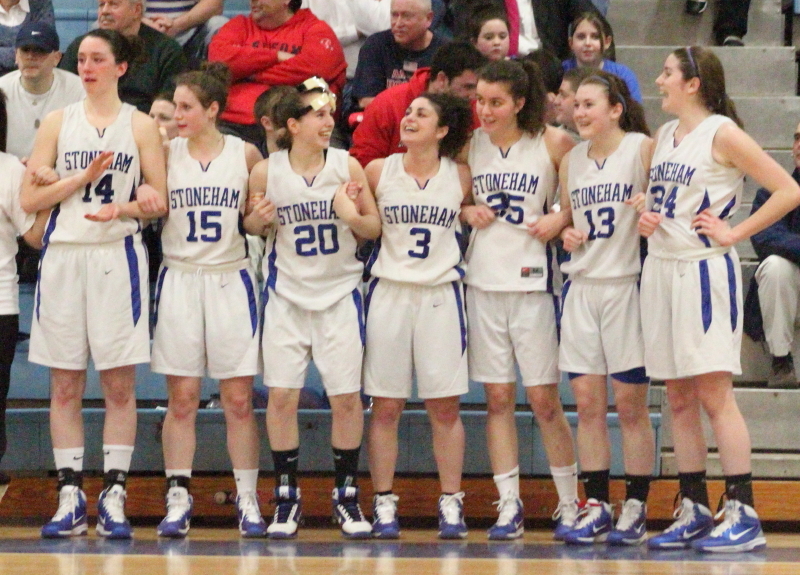 Stoneham (19-3) will face #2 seed St. Mary’s of Lynn (20-4) on Saturday afternoon (2PM) to determine the D3 North champ. Both teams are nicknamed, “Spartans.” What were the chances of that? 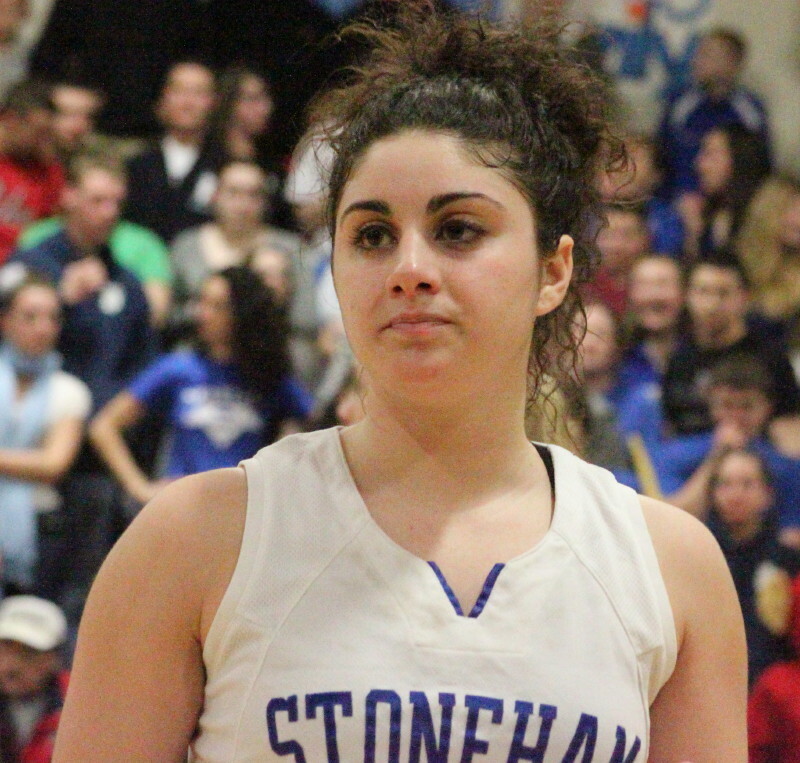 Stoneham broke open a tight (10-9) semi-final game with two minutes remaining in the first half by putting up nine unanswered points (six of them by Ariana Tuccelli) stretching into the start of the second period to take a 19-9 advantage. The Spartans went on to end that decisive second quarter with six straight (Ariana layup, rebound conversion by Jen Geraghty, and Sam Trant layup) and left at the half comfortably ahead, 27-14. Jen Geraghty and Ariana Tuccelli deny Hannah O’Flynn. Teams that face Ipswich (15-8) all try to neutralize the Tigers’ top scorer, Hannah O’Flynn. Stoneham was no different. Jen Geraghty fronted her and defensive help sagged in every time the Dartmouth-bound senior received a pass. This defensive approach usually opens up some good looks for other less-guarded Tiger players. Against Newburyport in the quarter finals, the supporting cast made significant scoring contributions. 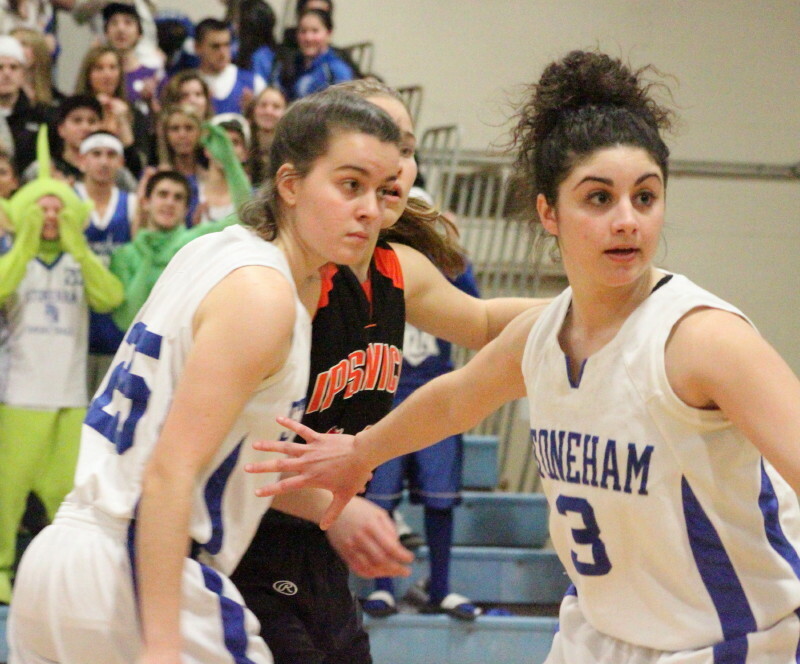 Not so, against Stoneham. 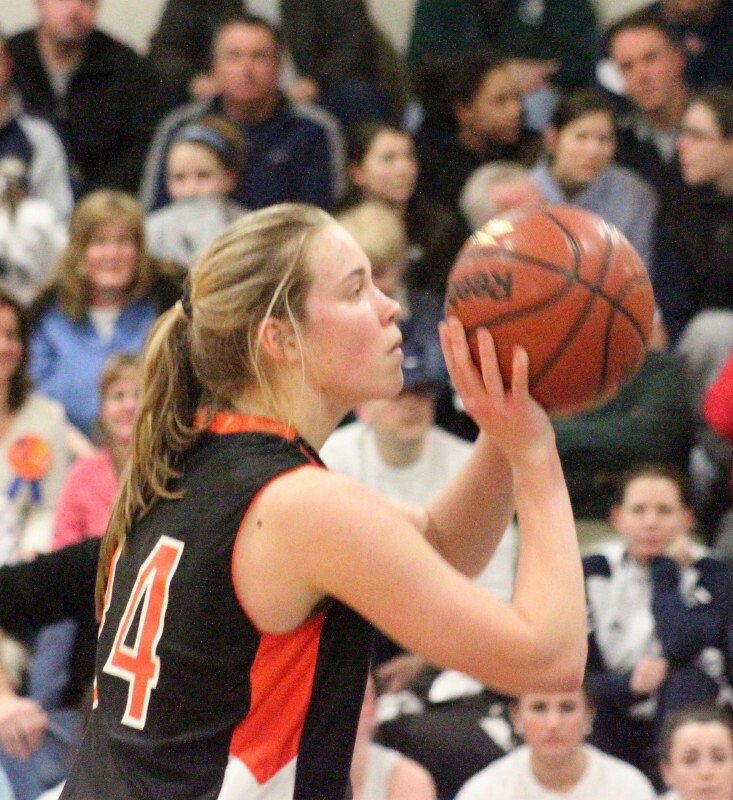 With Hannah neutralized, and the rest of the team unable to pick up the scoring slack, the Tigers were in serious trouble after Stoneham took the lead. The Tigers persisted in trying to get the ball inside to Hannah in the first half and ended up with five turnovers attempting it. 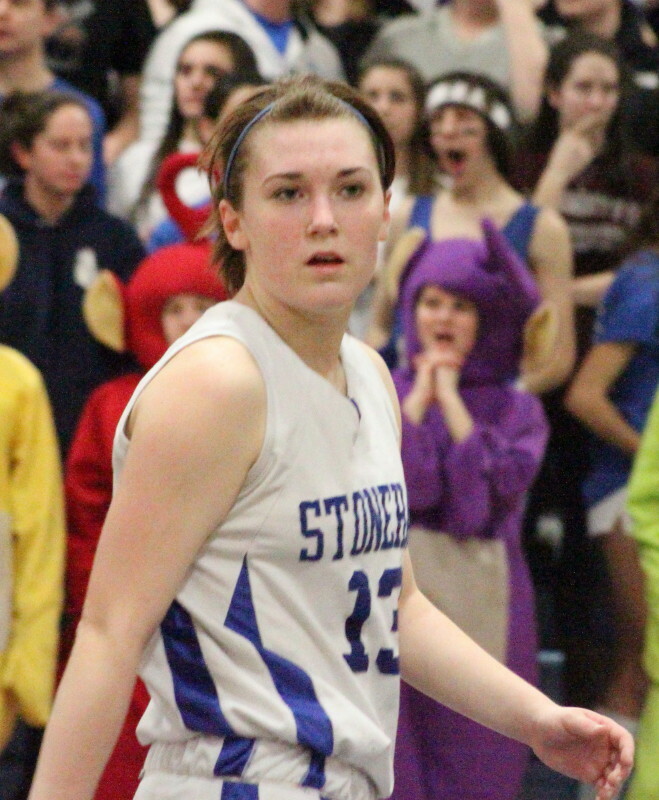 Tiger free throw shooting was a serious problem versus Stoneham. To further speed the Tigers road to elimination was pitiful free throw shooting. Ipswich was a shocking 6-for-23, including 3-for-15 in the second half, which destroyed any comeback plans. Meanwhile, Stoneham was 12-for-14 from the line. Rae Davis opened up the second half with a layup on a feed from Hannah O’Flynn that put some excitement into the Sea of Orange. The Spartans responded with a frosting-on-the-cake, eleven straight points over the next four minutes to get an insurmountable, 38-16, margin. This decisive streak featured an Alison Brennan three, a Vanessa Bramante layup, and a layup, a rebound conversion, and two free throws from Jen Geraghty. More basketball was played but the outcome during the last 1 ½ quarters was no longer in doubt. 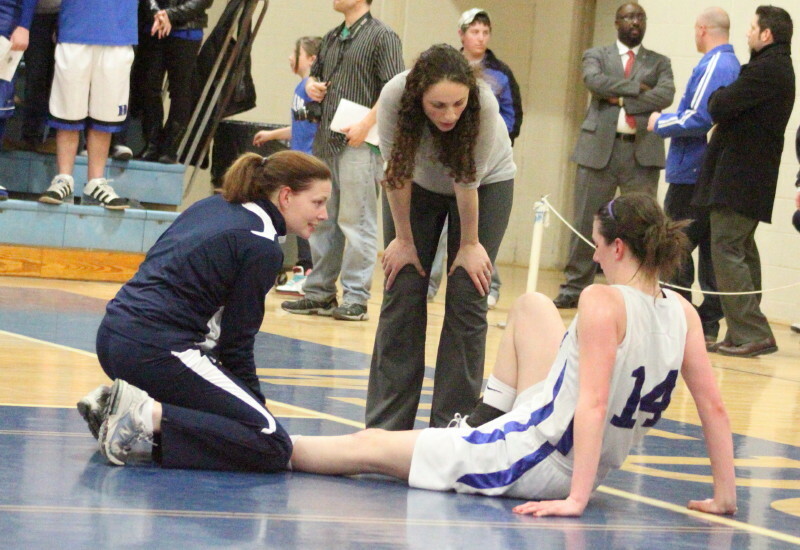 Senior Vanessa Bramante went down with a leg cramp in the third quarter and didn’t return to play but had fully recovered by game’s end. She and St. Mary’s Tori Faieta should be seeing a lot of each other on Saturday afternoon. 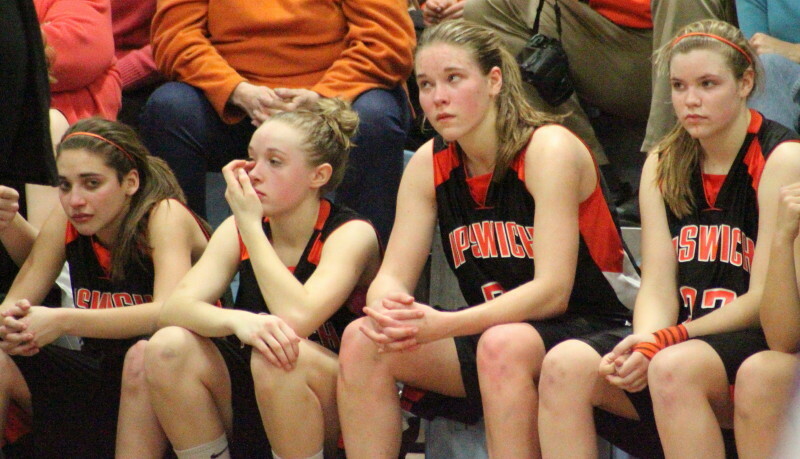 Ipswich girls lament season’s end. As tournament games wind down, the emotional highs and lows kick in. The excitement of playing yet another game, and this time in a big arena, stirs the winners while the seniors on the losing side realize that their careers are over. Ipswich will surely miss Hannah O’Flynn. Some players carry a team for a quarter or a game, Hannah literally carried the Tigers for the entire season. She was as strong a rebounder as she was a scorer. In her final game, Hannah paced Ipswich with thirteen points. Speaking of scorers, the Tigers all-time scorer (Amber Smith) was in the house. St. Mary’s coach Jeff Newhall was also an interested spectator. Ipswich team surrounded after loss. I liked the way the four busloads of Ipswich students gathered around their team after the game was over despite the loss. That’s what the best of fans do. That St. Mary’s/Stoneham game should be a good one. I think that despite defeating Ipswich decisively, Stoneham will have to play better to win. The area needing the biggest upgrade will be 3-point shooting. 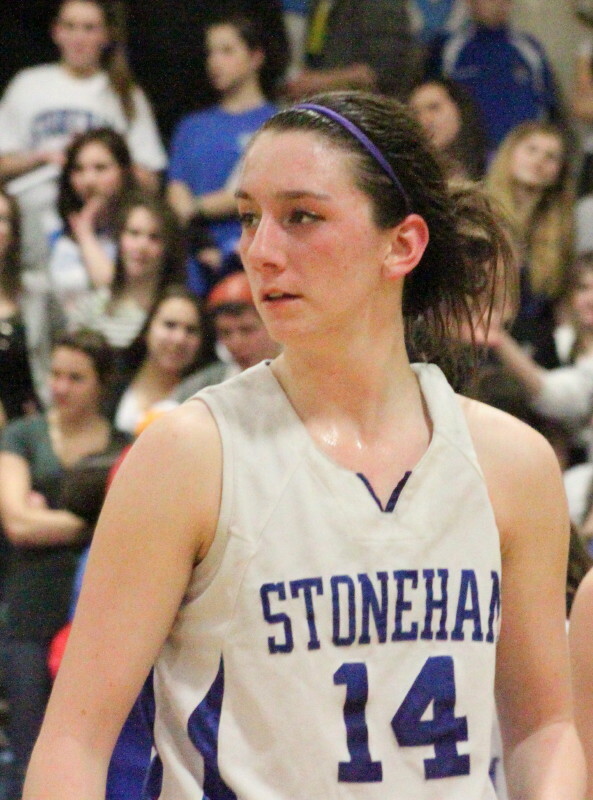 Stoneham made only one-of-eleven from long range.